The Otway Basin is a rift basin located in on/offshore South Australia, Victoria and Tasmania. It extends for 500 kilometres and covers the area from the west of Melbourne to Cape Jaffa in South Australia, to the north of King Island in the south. Major producing projects in the basin are all situated offshore Victoria/Tasmania and include Beach Energy’s Otway Gas Project (Thylacine and Geographe fields) and the Halladale, Blackwatch and Speculant fields, Cooper Energy's Casino, Henry and Netherby fields and BHP's Minerva field (near depletion). 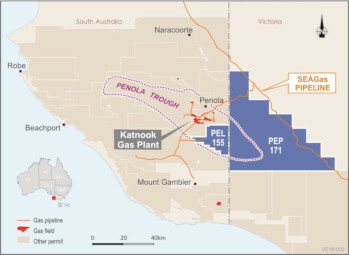 Gas has also been produced from the Katnook, Ladbroke Grove and Haselgrove fields in the Penola Trough, onshore South Australia. The basin is relatively under-explored by international standards, with potential for further conventional and unconventional gas discoveries in the Penola Trough and offshore area of the basin. Currently, the basin is serviced by three main processing facilities near Port Campbell in Victoria (Otway, Minerva and Iona gas plants). 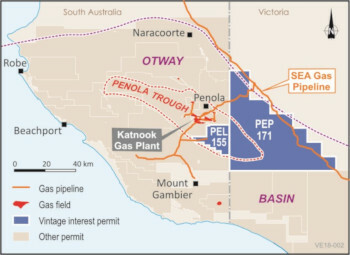 The Katnook gas processing plant is located near Penola in South Australia and is connected to various industries in the region and to Mt Gambier. All facilities are connected to the SEA gas pipeline which sends gas to both Melbourne and Adelaide. The Katnook plant was built and commissioned in 1991 and subsequently over 70 Bcf of gas and 0.4 MMbbls of condensate has been produced from the Pretty Hill Sandstone reservoir and supplied to local industry and the adjacent Ladbroke Grove power station, which was commissioned in 2000. All Penola Trough fields are currently shut-in. Vintage acquired a working interest in PEL 155 in the Otway Basin by way of a staged farm-in agreement with Otway Energy Pty Ltd, a wholly owned subsidiary of Rawson Oil and Gas, in turn now owned by Lakes Oil Ltd. 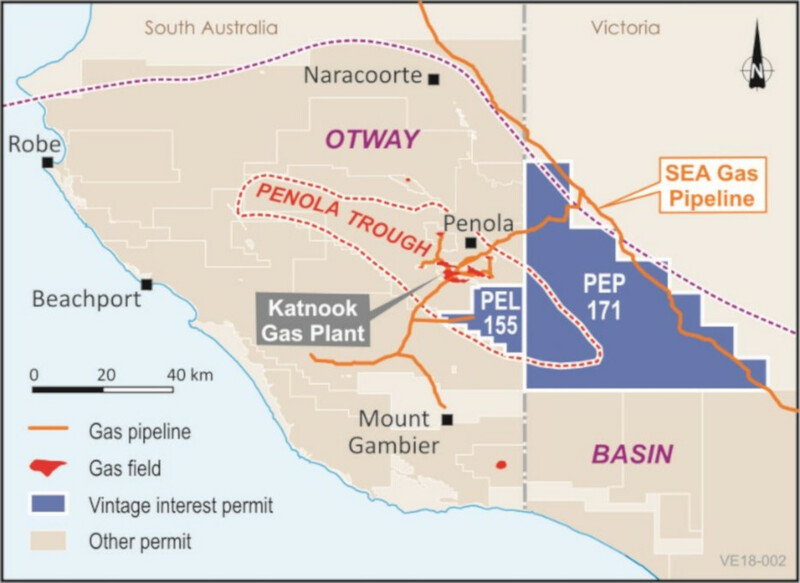 The joint venture is working toward drilling a gas exploration prospect (Nangwarry-1) located in PEL 155, approximately 10 kilometres southeast of the Katnook gas processing plant (operated by Beach Energy). Vintage has subsequently acquired an additional 25% equity in PEL 155, thereby increasing its equity share of the permit to 50%, as a result of the Joint Venture applying for and receiving a South Australian Government PACE gas grant. The South Australian Government's PACE gas grants are an initiative designed to further accelerate investment in gas projects in South Australia through targeted competitive grants. The $4.95 million grant will be applied to the drilling of Nangwarry-1. Vintage and Rawson will contribute to the cost of drilling Nangwarry-1 on 50:50 basis and the grant proceeds will be shared on the same basis. The prospect is a three-way dip, fault dependent trap in the Pretty Hill formation and is defined on 3D seismic. It is considered analogous to the nearby Katnook, Haselgrove and Ladbroke Grove fields which have produced substantial quantities of gas since discovery. A recent re-evaluation of existing 2D and 3D seismic identified four additional conventional leads, providing attractive follow-up targets in the event of a discovery. 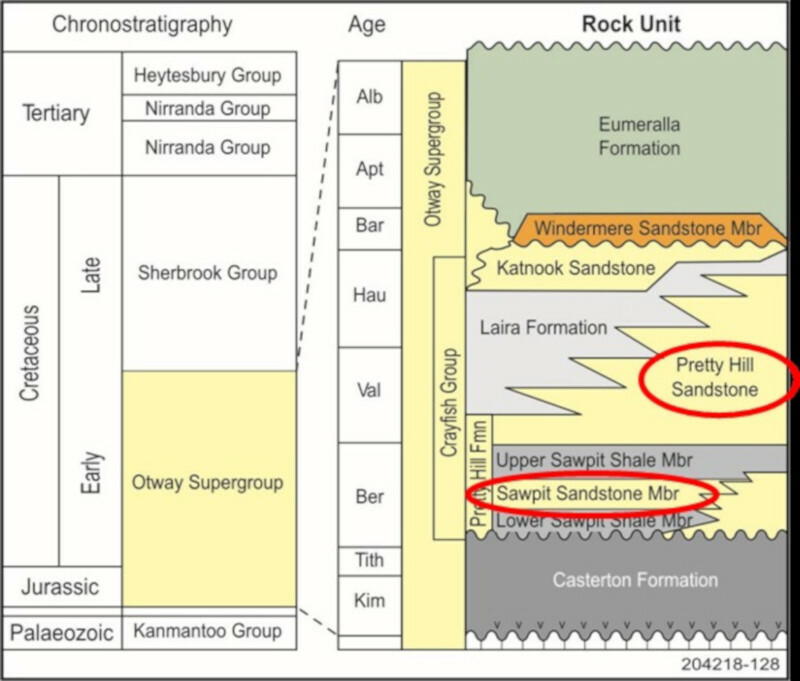 The Nangwarry prospect has been greatly enhanced by the new field discovery in the Sawpit Sandstone made by Beach Energy at Haselgrove‑3/ST-1. This well was drilled in an adjacent licence during late 2017 and is located approximately 8 kilometres to the north of the proposed Nangwarry-1 location. Beach Energy reported (ASX, 11 January 2018) a gas column extending over a gross interval of 104 metres of which 25.6 metres is net gas pay. The well was production tested and flowed at a tubing constrained rate of 25 MMscf/d through a 36/64” choke at a well head pressure of 2,700 psig. In addition, a gross gas column of 11.6 metres was intersected in the shallower Pretty Hill Sandstone, with estimated net pay of 8.5 metres. This well represents a significant new play discovery with an extensive gas column and provides for a renewed phase of exploration in the region. Deepening of the proposed Nangwarry-1 well will target the Sawpit Sandstone in addition to the top of the Pretty Hill Sandstone. 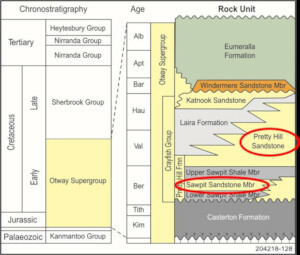 Drilling success will extend both a proven play province and the new Sawpit Sandstone play province. This will in turn lead to a greater level of exploration and appraisal in the region with the result being much needed gas to the South Australian market. Ultimately, it is hoped that continued investment in the area will rebuild the gas industry in the South East of South Australia, providing stimulus to industries in the region and alleviate issues of gas supply for power generation and other industries in South Australia. Gas supply opportunities exist via pre-existing pipeline networks connecting local industries and the eastern states gas supply network. The Joint Venture looks forward to working with the Government of South Australia, local industry and the communities of the South East to progress this exciting conventional gas exploration drilling opportunity. Vintage executed a formal farm-in agreement with Somerton Pty Ltd (a subsidiary of Cooper Energy Limited) on 21 February 2019, which replaces the previously executed Heads of Agreement. On execution of the Joint Operating Agreement, Vintage will be the operator of PEP 171. Vintage has earned its initial interest of 25% by agreeing to bear costs associated with the permit through to the end of the Victorian government onshore gas exploration and production moratorium period and undertaking a prospectivity review as permitted under the moratorium. Vintage has the right to acquire a further 25% interest (50% in total) by contributing 65% of the cost of a 100 km2 3D seismic survey up to an agreed cap. PEP 171, comprising an area of 1,974 km2, was awarded in August 2013 for a period of 5 years. Following the first term there is a right to one renewal with a 50% relinquishment. Due to a series of suspension and extension applications, Year 1 has ended, with the timing for completion of the work programs in subsequent licence years yet to be determined by the regulator, due to the effect of the moratorium explained below. impose a moratorium on any petroleum exploration and production in the onshore areas of Victoria until 30 June 2020 (or for as long as the moratorium continues). The obligations of the work program with respect to hydraulic fracturing, which had formed part of the year 3 work program are effectively suspended and cancelled. For the interim, the holding costs are minimal, and the expected remaining committed work program will be to acquire 100km2 of 3D seismic and the drilling of one exploration well. Following the results of the 2017 Haselgrove-3/ST-1 gas discovery, attention has refocused on the results of the Glenaire-1/ ST- 1 well drilled in PEP 171. This well encountered good gas shows in the Laira Formation and Pretty Hill Sandstone during drilling in 2006. A thickness of 8.8 metres of net gas pay was interpreted in the Pretty Hill Sandstone and a test in the Laira Formation recovered 12 barrels of oil but the well was considered uncommercial. The plan is to correlate the existing seismic between Glenaire-1/ST-1 and Haselgrove-3/ST-1 and to the Nangwarry-1 well after drilling. Nine leads are currently recognised which are primarily fault-bound, dip closures, however the seismic data quality is poor to average, particularly deeper in the section, requiring a 3D survey to identify the optimum drilling location. The Joint Venture looks forward to working with the Government of Victoria, local industry and the communities in Western Victoria to progress this exciting conventional gas exploration opportunity.